Here it is! 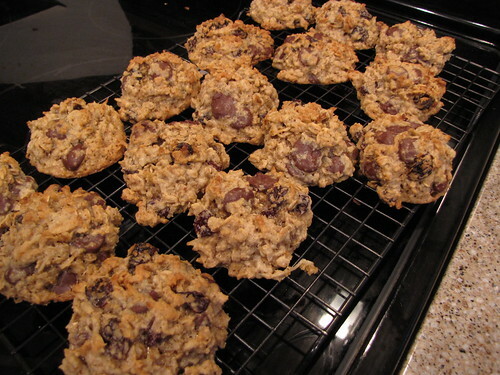 The long awaited recipe for Jen’s Famous Gluten Free Cookies! Otherwise known as The World’s Best Gluten Free Cookies. I can take absolutely no credit for these cookies other than the fact that I was smart enough to become friends with Jen on day one of graduate school. Those of you who know Jen know what a fabulous cook and baker she is. What you might not know is that she is the only person I know who can bake without measuring the ingredients. Really! I don’t know how she does it but I’ve witnessed it with my very own eyes. So, when I asked for the recipe for these amazing cookies, she didn’t know exactly what to tell me. Not one to take no for an answer when cookies are involved, I went to her house last week and watched her bake 2 batches of these beauties. She baked, I scribbled notes and measurements. This recipe can be gluten free as shown here or also made traditionally with regular old all purpose flour. I’ve included both options in the recipe. Butter, Brown Sugar, Eggs, Salt, Vanilla, Old Fashioned Oats, Almond Meal, Oat Bran, Coconut, Chocolate Chips, and Dried Cherries. More and more of my friends are going gluten free these days. Good thing there are some good options so you don’t have to give up gluten and give up cookies at the same time. Even if you are a gluten eater like me, you will NEVER know that these are gluten free cookies. In fact, having had them both ways, I prefer the gluten free variety because they stay moister and don’t harden like the traditional flour made cookies. 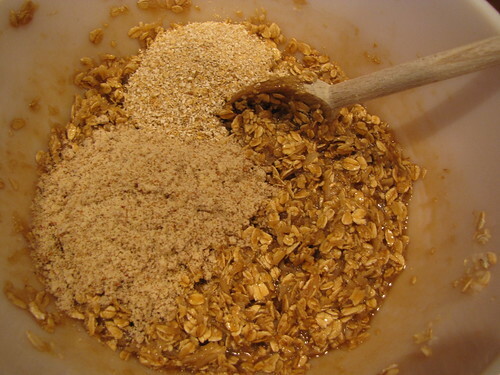 In place of the flour, you’ll need almond meal and oat bran. Mine are from Trader Joe’s but you can find them in regular grocery stores too. Some stores have a gluten free section full of interesting flours and grains from companies like Bob’s Red Mill and King Arthur Flour. While we were experimenting with the recipe, we also tried one batch using Gluten Free All Purpose flour (NOT recommended) and didn’t like the consistency of the cookies. Oat bran and almond meal are better for you anyway. 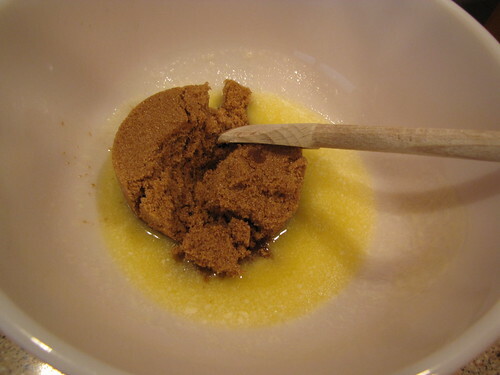 In a large bowl, melt 1 stick of butter (1/2 cup) in the microwave for about 1 minute. 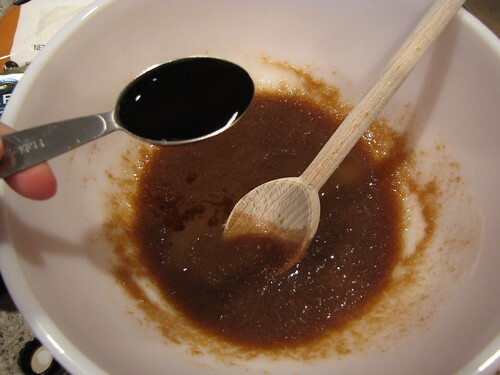 When the butter has melted, add 1 cup of lightly packed dark brown sugar and stir it thoroughly into the butter. 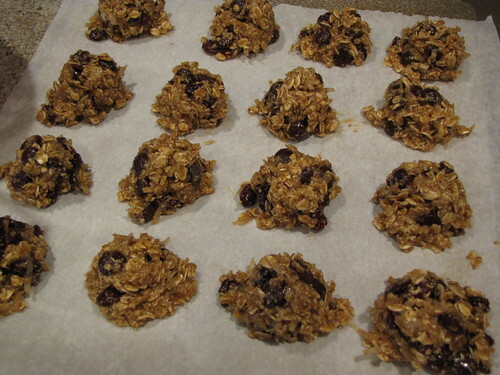 Using melted rather than softened butter helps the cookies to stay moist, helps the sugar to dissolve, and helps the oats to rehydrate. Plus you don’t have to worry about softening the butter in advance…something I always forget to do. Jen advises to stir aggressively and thoroughly after adding each ingredient. Add 1 Tablespoon of vanilla and a pinch of salt. Jen likes Mexican vanilla for the flavor. I have regular old pure vanilla extract. 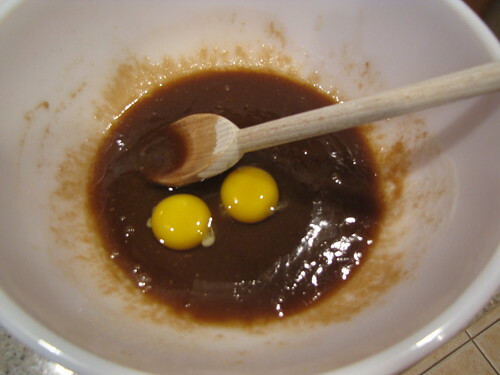 Add 2 eggs and stir to combine. 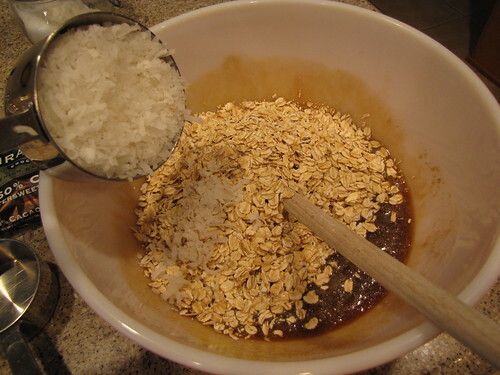 Pour in 2 cups of old fashioned oats (not quick or instant please) and 1 cup of coconut flakes. 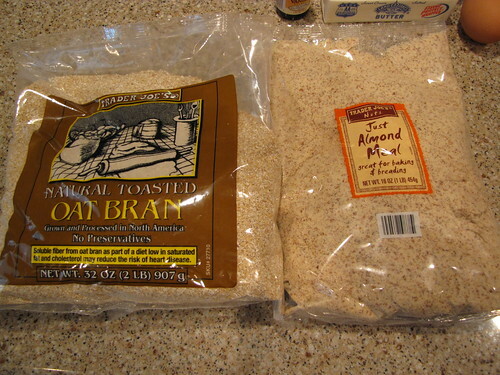 If you are going gluten free, add 3/4 cup of almond meal and 1/3 cup of toasted oat bran and stir to combine. 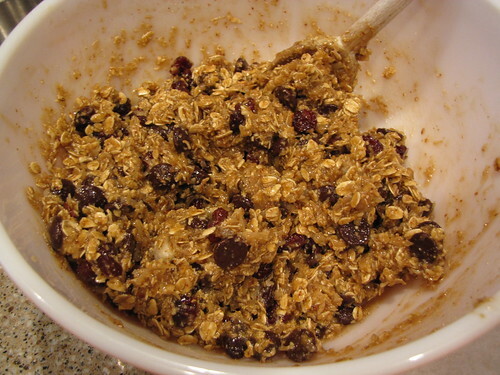 If you are NOT going gluten free, substitute 1 to 1¼ cups of all purpose flour for the almond meal & oat bran. Now for the good stuff! 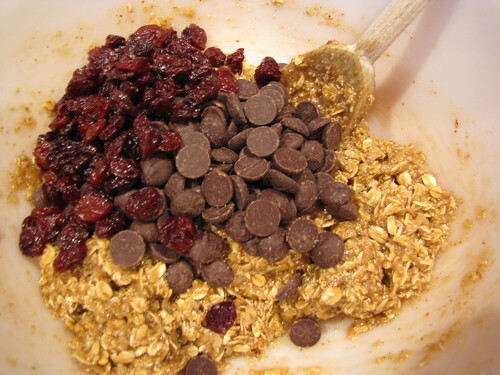 Add 3/4 cup of dark chocolate chips and 3/4 cup of dried cherries. 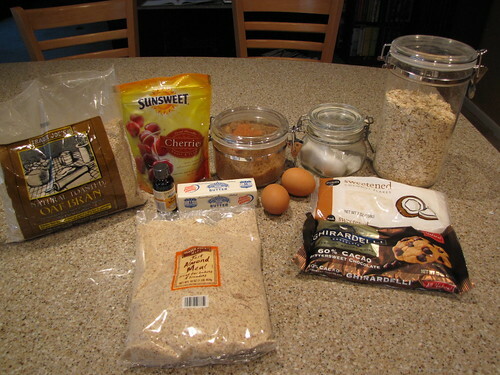 OR for another variation, use 3/4 cup of white chocolate chips and 3/4 cup craisins/dried cranberries. Stir all of the ingredients together so they are thoroughly combined. This dough will be a little wetter than traditional cookie dough. 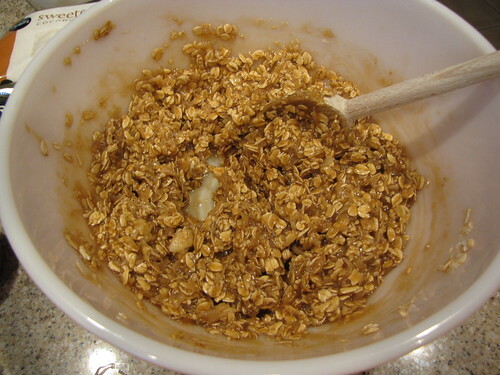 If your dough is too wet and won’t hold together when you scoop it, add more almond meal and/or oat bran 1 Tablespoon at a time. Prepare a cookie sheet with non-stick spray or a piece of parchment paper. These cookies will stick so be sure you don’t skip this step. Use a medium sized ice cream scoop (mine is a 1½ inch scoop) and scoop out mounds of cookie dough. Since the cookies don’t have any leavening ingredient like baking powder, they will mostly stay in little mounds and not spread. Bake at 350 degrees for 20 minutes. The cookies will be golden brown and look slightly underdone in the middle. Do not overbake, they will set up nice and firm as they cool. Cool the cookies on a wire rack or piece of waxed paper. Each batch makes about 18 cookies so decide who is cookie worthy or make a double batch! When we were playing the opera last week, Jen brought 2 batches of these along with a batch of traditional chocolate chip cookies backstage for the musicians. Guess which ones were devoured first? These are the bomb. So is Jen! Here’s the recipe – shamelessly pirated from Jennifer Gerth, clarinetist and cookie baker extraordinaire! Oh MY goodness wowwowwow and you are sweet to share such tasty goodness! Honestly, Jen gets ALL the credit! I’m a terrible baker because I’m a terrible measurer. Jen won’t be my friend will she? Loved the cookies. You are doing a good thing for the world, dear heart. we are in Tampa. Would love to see you! My flute repair guy used to live in Marietta but he moved up near Chicago. Boo! I miss my yearly jaunt through Georgia! Opera cookies! Love the variations! Sounds like they sang their hearts out! The Verde project sounds fascinating. It must be so interesting and form such a comraderie to do a long term project.